Elections are a natural, integral part of a healthy democracy. We envision this brief voter guide to be used as a tool to inform voters about issues regarding women in British Columbia and to provide focusing questions for candidates. Our hope is that voters will use the questions in election forums, online through social media, or by emailing or phoning their candidate to engage with their candidates on issues that matter to them. In the long term, we hope that the guide provides a lens towards women’s issues in politics that are often overlooked during elections. By realizing how integral and intersecting women’s issues are to broader electoral topics like the environment or the economy, our aim is to help Canadians voting in B.C. to highlight some of these issues before they cast their vote and to hold attention on those issues after the election. Veronica Harrison, UVic Political Science and Psychology student, former Director at Large and UVSS Chairperson. Caitlyn Pal, UVic Political Science student, former Director at Large with the UVSS. The project began in Jan 2011 and continued through March 31st. We made limited revisions in April after the election was called. 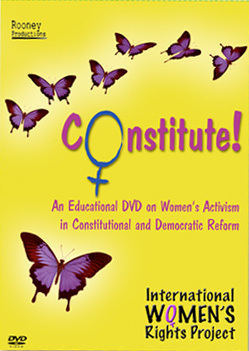 We want to thank Susan Bazilli, Director of the International Women’s Rights Project at UVic for the idea and guidance. And, we also want to thank the Political Science department and the students in Poli 335: Gender and Politics for their conversation, energy and patience. Please send any comments, ideas or questions to info@iwrp.org. I’ve just taken a look at your Guide and find it very well done. Congratulations! It has a great advantage over our NAC Guide, which is of course that anyone can access yours on the Internet, which didn’t exist when we produced the NAC Guide. The Internet also allows you to add to or change your Guide as you wish so that you can use it in many elections. It would be great if similar Guides existed for all Canadian jurisdictions. I hope your example will inspire many others. Louise Dulude, Former NAC President from 1986-1988.